Dr. Michael Alessandri is the Executive Director of the University of Miami-Nova Southeastern University Center for Autism and Related Disabilities (UM-NSU CARD). Dr. Alessandri has been a professor at UM since 1996 and has worked with individuals with autism and their families since 1981 in various capacities. He is a Phi Beta Kappa graduate of the University of Rochester, and obtained his MS and Ph.D. in Psychology from Rutgers University. 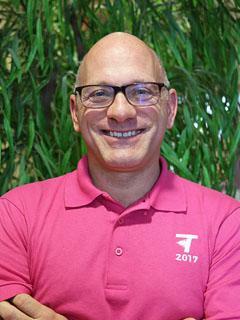 At the University of Miami, Dr. Alessandri, in addition to his other roles, also serves as the Department of Psychology’s Assistant Chairman for Community Outreach and Engagement. Dr. Alessandri has presented, consulted and published internationally on developing appropriate and effective educational programs for students with autism. In addition, he has received numerous research and service grants (totaling over $30 million) and several notable awards within the field including the Autism Society of America’s Wendy F. Miller Autism Professional of the Year Award and National Autism Program of the Year for UM-NSU CARD. Dr. Alessandri has also received numerous other community service awards, including the March of Dimes Community Excellence in Health Care Award (2007), the Health Services Coalition Outstanding Community Leader Award (2009), and the Parent to Parent Excellence in Family Advocacy Award (2010). He was also named one of the Ronald McDonald House's 12 Good Men (2008) and the Dewar's 12 Man of Distinction (2007). In 2012, he was selected by the Children's Trust as the David Lawrence Champion for Children, one of South Florida’s highest honors for community service. In 2016, Dr. Alessandri was named the Visionary Leader of the Year by the Greater Miami Chamber of Commerce; and in 2017, he was recognized by the Dade County Bar Association with the Fostering Inclusion and Diversity Award. My active involvement in school- and community-based consultation, support, and program development, through my work at the University of Miami Center for Autism and Related Disabilities, contributed to a growing interest in studying broader intervention packages for individuals living with autism across the lifespan, including preschool-based interventions and interventions aimed at reducing anxiety in adolescents. As site PI for a multi-site comparative efficacy study of preschool intervention models, I, along with our collaborative research team, was eager to contribute to the scientific discussion aimed at understanding how widely used school-based interventions compare with each other. In our most prominent work, our collaborative research team found no notable differences in outcome for students in high fidelity TEACCH, LEAP or Business as Usual classroom models. This paper was named as one of 20 top advances in ASD research for 2013 by the Interagency Autism Coordinating Council (IACC). Hume, K., Boyd, B., McBee, M., Coman, D., Gutierrez, A., Shaw, E., Sperry, L., Alessandri, M., & Odom, S. (2011). Assessing implementation of comprehensive treatment models for young children with ASD: Reliability and validity of two measures. Research in Autism Spectrum Disorders, 5, 1430-1440. Coman, D., Alessandri, M., Gutierrez, A., Novotny, S., Boyd, B., Hume, K., Sperry, L., & Odom, S. (2013). Commitment to Classroom Model Philosophy and Burnout Symptoms Among High Fidelity Teachers Implementing Preschool Programs for Children with Autism Spectrum Disorders. Journal of Autism and Developmental Disorders, 43 (2), 345-360. Boyd, B.A., Hume, K., McBee, M.T., Alessandri, M., Gutierrez, A., Johnson, L., Sperry, L., & Odom, S.L. (2014). Comparative efficacy of LEAP, TEACCH and non-model-specific special education programs for preschoolers with autism spectrum disorders. Journal of Autism and Developmental Disorders, 44(2), 366-380. Ehrenreich-May, J., Storch, E.A., Queen, A.H., Hernandez Rodriguez, J., Ghilain, C., Alessandri, M., Lewin, A.B., Arnold, E.B., Murphy, T.K., Enjey Lin, C., Fujii, C., Renno, P., Piacentini, J.C., Laugeson, E., & Wood, J.J. (2014). An open trial of cognitive-behavioral therapy for anxiety disorders in adolescents with autism spectrum disorders. Focus on Autism and Development Disorders, 29(3), 145-155.